OK we're nearing our official start time and so far the big complaint I see is that people are still confused about what the hell is going on with points. So I will try to make this as clear as I can. On a practical, from your perspective level, here is what is going to happen. Sunday you will check TAY for your level goal. This will be up at 6:30am. If you can't find it search TAY for Run Club and it should be the first or second post on Sunday. Now you have a level goal, so what. That number that you check for is the number of points you need to pass this week's level. If everyone on your team meets or exceeds their level goal then your team progresses to the next level. Otherwise you have to try again. You can also opt to try again even if everyone meets their level goal. Points are gained by exercising. You use whichever method gets you more points. IE. if you walk ten minutes, but only 0.5 miles - take the ten minutes = 1 point. For every mile you run/walk/jog you get 1 point. OR for every 10 minutes of exercise you get 1 point. Achievements are worth 1 point and can be gained by doing various things during or regarding your exercising. So now you have met your level goal in terms of points. Time to put your feet up and wait for the end of the week! Or not. You can go above and beyond your level goal and every extra point you get can be banked. Towards next week's level goal. To help someone who did NOT meet their level goal. You can give your banked points to someone else to help them reach their level goal. Towards Individual or Team power ups. Power ups either hurt the other team or help you in some way. So, you get your level goal and you go running for 5 miles. You want to log your points. From 1/5/14 to 1/11/13 log your points here. Thereafter Neryl and TUT have created a nice spreadsheet where you can log your points. DO NOT MESS WITH THE SPREADSHEET OR I WILL FIND YOU. We're trying an on your honor thing here, and I already voiced my concerns to Neryl, then last night someone deleted the whole thing....so we're not off to a great start. People, enter your points, then get off, do not play with other's points. Do not delete anything. If you accidentally the whole thing, let Neryl know and she can restore a back up or something. The list of players is here. If you don't see your name and you want to play, let me know. After this week, sign ups are closed and the game begins! 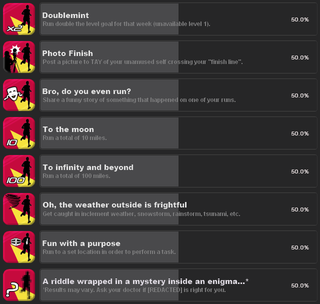 Everyone give Kaploy a pat on the back for sprucing up the achievement stickers. Still looking for someone to give the Power Ups a go! Odin has volunteered to help, but he needs someone with web hosting capabilities. Let me or him know if you can provide.